We are looking forward to seeing you at our 2019 sale: Saturday, March 9. Please join us for lunch at noon and a bid-off for the private treaty sale at 1 p.m. at Brad Z Ranch, located west of Guthrie Center, Iowa. 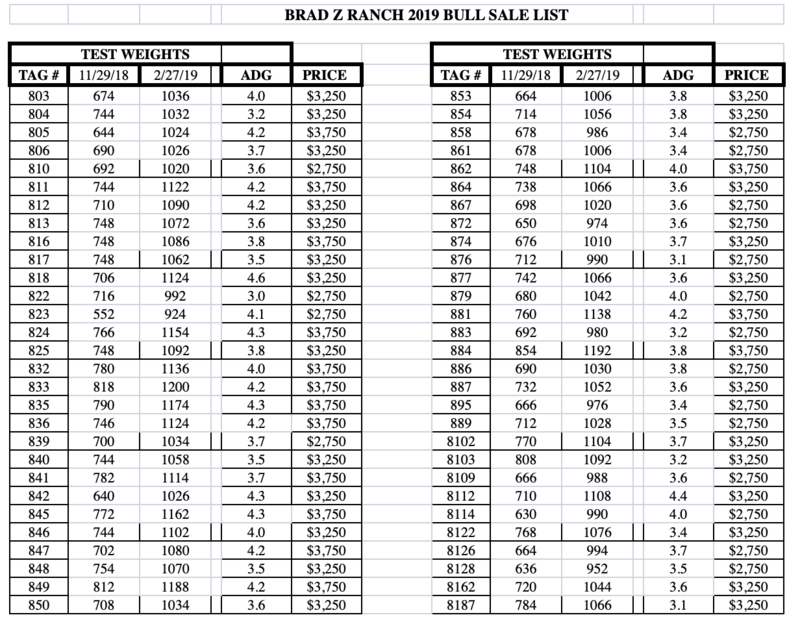 Please look over our EPD data about the 50 Angus and Simm/Angus bulls we are offering, as well as price and rate-of-gain info. We will also sell 20 bred females and 20 virgin heifers. When you buy breeding stock from Brad Z Ranch, you can rest assured that we have tested them in many areas. The steers and heifers that don’t make the cut are fed out in a commercial feedlot (Van Meter’s). In 2017, we finished 78 head of steers that averaged 1417 pounds after a 4% shrink. They were right at 14 ½ months of age when harvested at Tysons. Carcass data was collected by Daryl Bubee carcass collection group. The steers graded 100% Choice and Prime with an average carcass weight of 888 pounds. They had an average ribeye measurement of 13.9” and average fat cover over the 12th rib at .62. Over 85% were Yield Grade 2 and 3. We also fed out 60 heifers in 2017. They averaged 1253 pounds after a 4% shrink. The heifers average carcass weight was 769 pounds with average ribeye measuring 12.9” and average fat at .54. In addition, 64% were Certified Angus Beef (CAB). And 43% were Yield Grade 2 and 40% Yield Grade 3. We hope to see you on March 9. 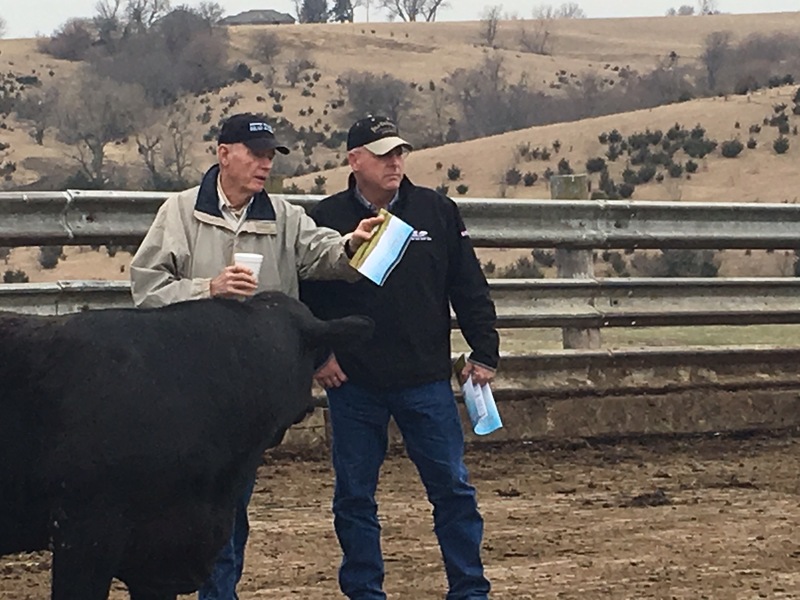 Jim Bradford and a customer looking over Brad Z Ranch’s 2016 bulls.